A structured product is defined as a pre-packaged securitised investment product with full or partial capital protection which is listed on a stock exchange like a normal share and has a daily market value. Think of it as investing on the stock market with little or no risk. Who wouldn’t want that? Structured products have soared in popularity over the last decade. Where it used to be the exclusive domain of wealthy investors and large institutions, it is now freely available to ordinary investors due to rapid technological advancements. Children going to University in five years’ time. Already retired, but need to be exposed to the market for additional capital growth to fund living longer in an increasing inflation environment, but don’t want to risk current capital. Structured products have the unique ability to react quickly to capture market opportunities over the short to medium term. To mitigate risk and volatility over the short term, most structured products offer full or partial capital protection provided the investor remains invested over the full term. A bank issues a securitised note which tracks one or more local and global market indices where the bank feels it can benefit from certain anticipated market conditions over a fixed term, usually five years. The bank raises the capital required for the investment from investors and in exchange, offers investors certain benefits, the most important one being full or partial protection of the original capital invested. The structure promises to pay the investor “x” if the investment achieves “y” at the maturity date. If “y” is not achieved, the investor receives their original capital back intact. In most cases the “y” amount represents the growth of the asset on a one for one basis. For example; If the return on the note is positive, say 7%, the investor will earn double the return, 15%. The bank usually caps this return and anything earned in excess of the 15% belongs to the bank for their efforts. If the notes return is negative, and the investor opted for full protection, the investor receives their capital back. 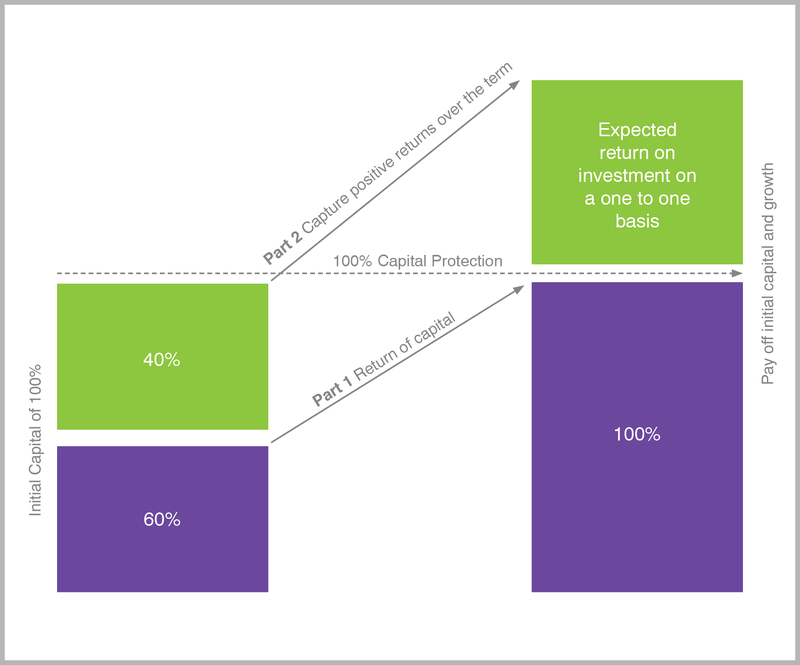 Some structured notes offer less capital protection in return for higher returns, however, if the notes return is negative, the investor participates one for one on the downside. A portion of your investment is used to purchase an investment that will guarantee your initial capital back at maturity no matter what the markets do. The remaining portion of your investment is exposed to underlying indices to capture positive market returns over the term of the investment. 40 % of the investment amount after fees and costs is used to purchase the underlying index to provide the investment return, but is based on the full 100% invested after fees and costs (Part 2)The note can also be “wrapped” in a five year term endowment policy offered by a life assurer for financial planning reasons such as ensuring the intended investment strategy is fulfilled for the benefit of the nominated beneficiaries even though the initial investor dies before the maturity date. Access ordinarily “hard to get” assets from some of the world’s leading economic zones. Confidently invest in irrational markets by reducing risk and short term market volatility by fully or partially protecting the initial capital amount over the full term of the investment product. Most structured products are governed by the Financial Markets Act (FMA), the Financial Services Board (FSB) and where an endowment policy is used to wrap the note for estate planning purposes, the Long Term Insurance Act (LTIA) ensuring that members are protected against unjust treatment. Unlike owning a single shares and having to search for a willing buyer if you wish to sell your structured product, it can be immediately liquidated at fair value on any day the stock exchange is open. Most structured notes are designed to take advantage of the various tax concessions enjoyed by the issuers which are then passed on to the investors. An example is where a structured product is wrapped in an endowment policy a fixed rate of tax is applied to the gains based on the life companies tax rate which is often lower than super tax rates for individuals. Besides the price of the note itself, there are other fees such as transactional charges to acquire the note on the stock exchange, annual administration fees, life company annual fees where an endowment wrapper is used, value added tax, and financial advice fees where applicable. In most cases the fees are contained in the price of the note and paid once off, ensuring that the structure can participate in the market on an unfettered basis without incurring harmful costs during the term. Investing in a structured product does not give investors the right to vote at Annual General Meetings (AGMs) of the underlying securities, as you own a portion (unit) in the note and not the underlying securities themselves. The purchase price of the note will always vary slightly from the selling price (aka the net asset value or NAV of the underlying assets). This difference is attributable to the management and administration costs and market forces such as supply and demand. The price of the note is linked to the performance of the underlying assets and may fluctuate in line with the market. Structured Products are provided by banks, so the investor takes on the credit risk of the issuing bank. If the Structured Products is wrapped in an endowment policy, the investor also accepts the capital adequacy risk of the chosen life assurer. Investors should also be aware that some Structured Products may cap the “upside” growth, meaning that despite having capital protection, if markets run, investors may lose out on some of that run – but, on the other hand, if markets fell, investors would be protected.